Evolution. Dell launched a slim and portable line in its entry-level business range with the Vostro V130. It's also supposed to convince in terms of design. Powerful Intel Sandy Bridge CPUs follow the first attempts with ULV processors. A few modifications have also been made on the case. Our comprehensive review now follows the preview. 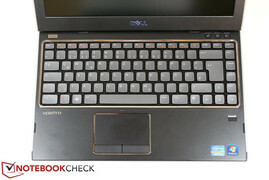 As the name suggests, the new Vostro V131 is an upgrade of the Dell Vostro V130 (reviewed by us here). Slight modifications have been made to the case and completely renewed inside. Thanks to the latest Sandy Bridge processors, the Vostro V131 is now to be equal to 14 and 15 inch office computers in terms of performance. 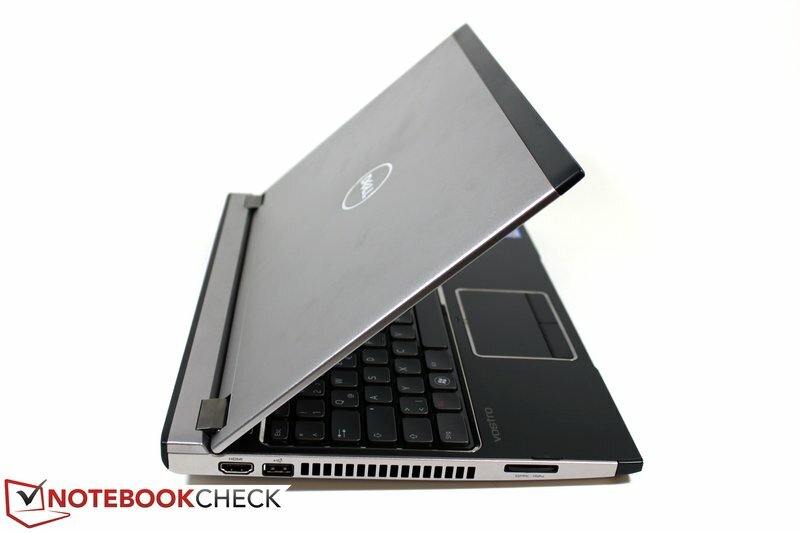 However, this also increases power consumption, which Dell henceforth wants to master with a replaceable 6 cell battery. 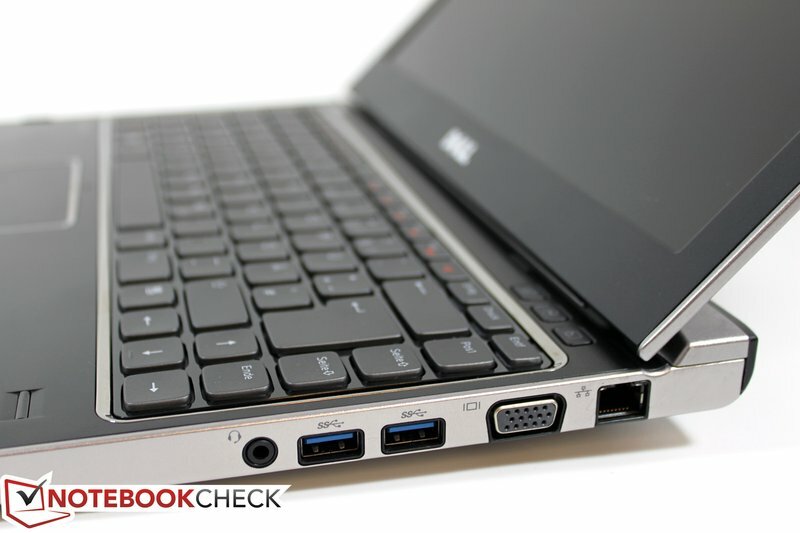 Too bad: It protrudes a bit out of the case and elevates the laptop in the rear by about one centimeter. Looking at the mentioned case size, you'll hardly find any noteworthy changes. Merely the case's depth has increased by 8 millimeters according to the specs. But the naked eye won't really discern that. 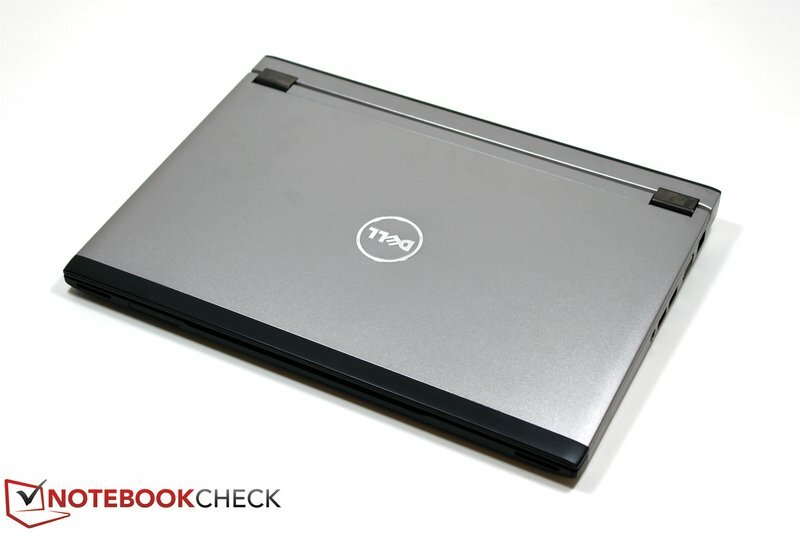 Dell states the laptop's maximum height to be 21 millimeters. That's not quite right since the battery stands out by about 10 millimeters on the notebook's bottom in that area. This doesn't have a significant impact when used on the desk and the base unit's bottom might even be able to discharge waste air even better. However, you have to come to terms with the bulging battery on your lap in mobile use. An even bottom would have definitely been advantageous. The Vostro V131 almost looks exactly like its predecessor. The concept of enclosing metal components still makes for a high recognition value. But the Vostro V131 can't only score with its looks and feel, the stability also benefits from the surrounding metal parts. Both the display lid and the base unit's bottom cope well with selective pressure. Possible warping is kept within limits on both parts. 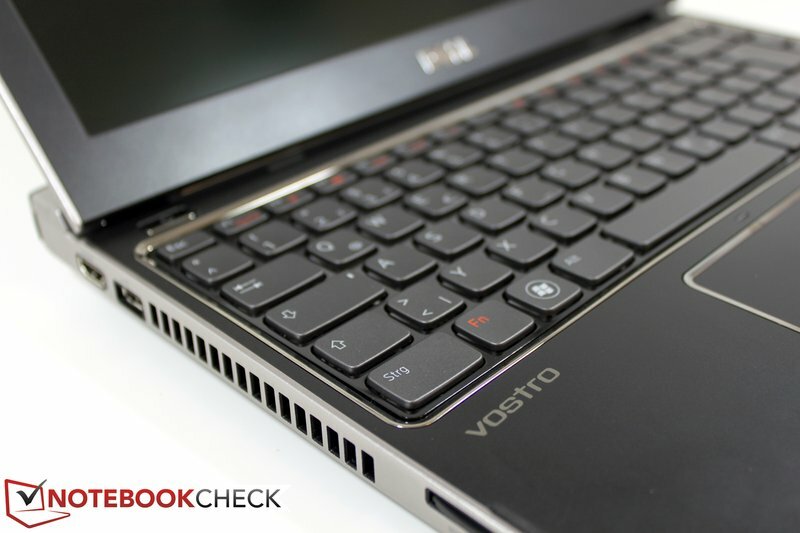 However, the Vostro has to admit clear defeat, for example, in face of the Apple MacBook Air 13 that was also in our office at the time of the review - and that although the Air is only half as thick as the Vostro. The opening mechanism has basically been maintained. So, the hinges are mounted in the area behind the display where the case is elevated. Consequently, the display is moved closer to the user than is the case in conventional solutions. Although the metal hinges make a solid impression, they can't prevent the display from teetering quite intensely. This was noticed quite disagreeably in the test especially during use on unsteady surfaces, for example directly on the lap. Finally, we'd like to deal with the case's weight. The new Vostro V131's weight adds up to 1850 grams with the 6 cell battery that belongs to the standard configuration in Europe. The Vostro V130 was therefore about 200 grams lighter with 1638 grams. When we again look beyond the horizon, we'll for example see Samsung's premium 13 inch 900X3A, with 1.35 kilograms and Apple's MacBook Air 13 with 1.33 kilograms as best of the class. 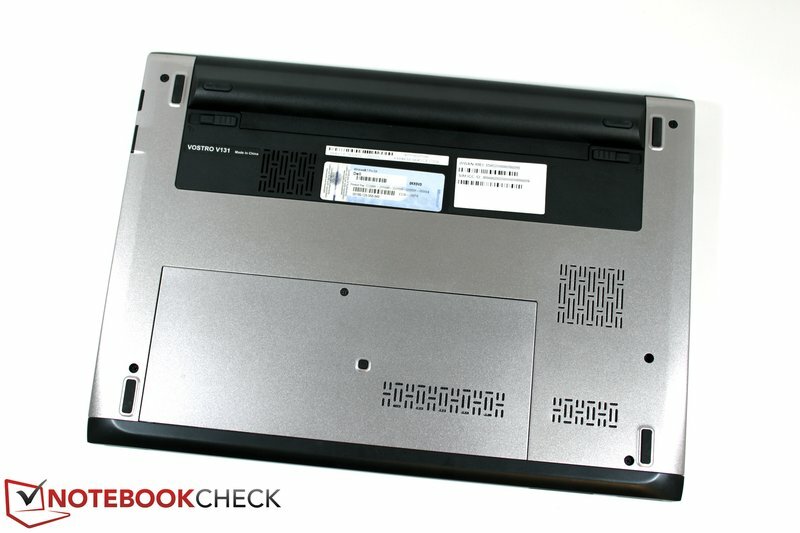 Sony's Vaio SA2Z sooner comes close to the Vostro with 1.65 kilograms. 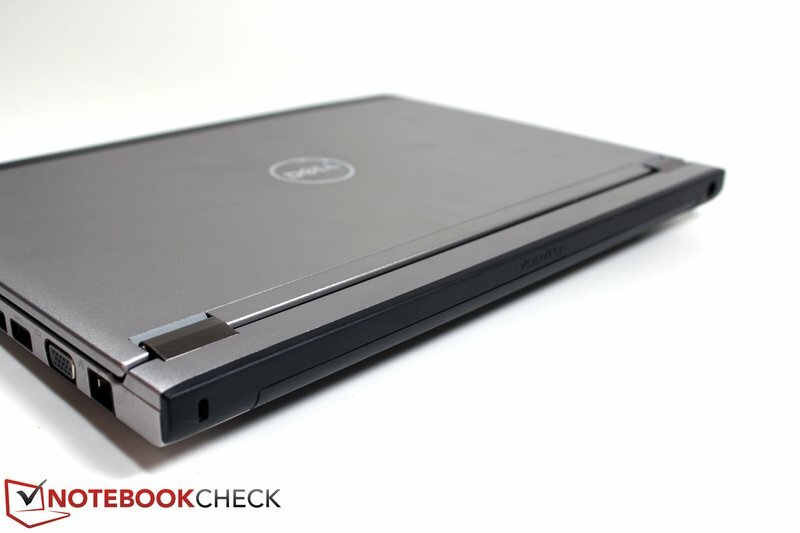 First Dell's standard Vostro 3350 is not only thicker (up to 29 millimeters), but is also noticeably heavier than the V131 with 2.19 kilograms. 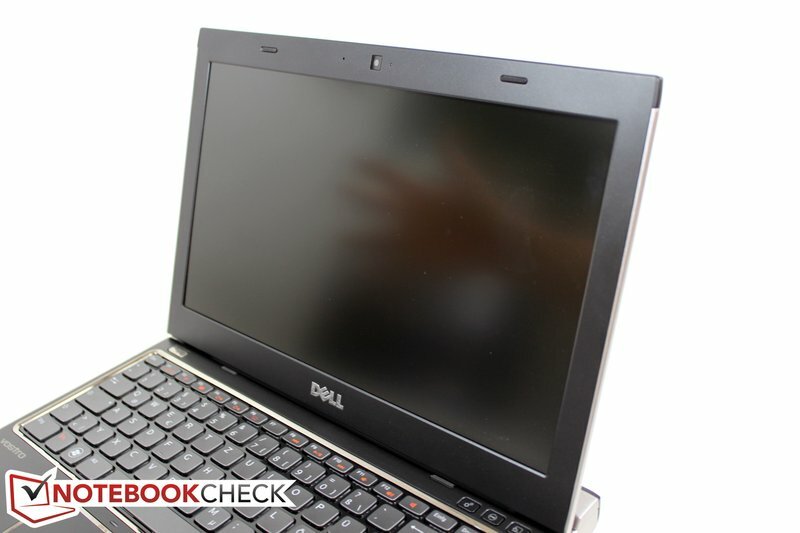 Dell has made a not insignificant improvement in terms of interfaces. The V130's three USB 2.0 ports have been replaced by two super speed USB 3.0 ports and a powered USB 2.0 port that can supply external devices with power when the laptop is off. The Vostro still has VGA and HDMI installed as video interfaces. There is no docking port. There have been quite a few changes made in the port arrangement due to the battery. With exception of the power socket and Kensington slot, all ports have been moved to the lateral edges and remain agreeably in the back area. This should keep the obstructions caused by connected cables within limits. The card reader moves from the left to the right and there is still no optical drive. In terms of communication, the Vostro 131 provides a LAN socket (Realtek Gigabit Ethernet), WLAN (Intel Wireless N1030), Bluetooth 3.0+HS and optionally even mobile broadband Internet (Dell 5550). The integrated UMTS modem costs about 100 euros extra. While the slot for the corresponding SIM card was still easy to access on the Vostro V130's front, it had to move for the refresh. The Vostro V131 also supplies a range of security features as an entry-level business device. The fingerprint reader included in the standard scope of delivery to name an example. But many offered data security services (Trendmicro Worry Free, DataSafe Online Backup) and support services (ProSupport up to three years with onsite service on the next business day, optional accidental damage protection). The 3 year onsite service makes a difference of 160 euros net in comparison to the 12 month standard warranty. Not much has changed in regard to the installed keyboard's layout. But a lot in terms of looks. 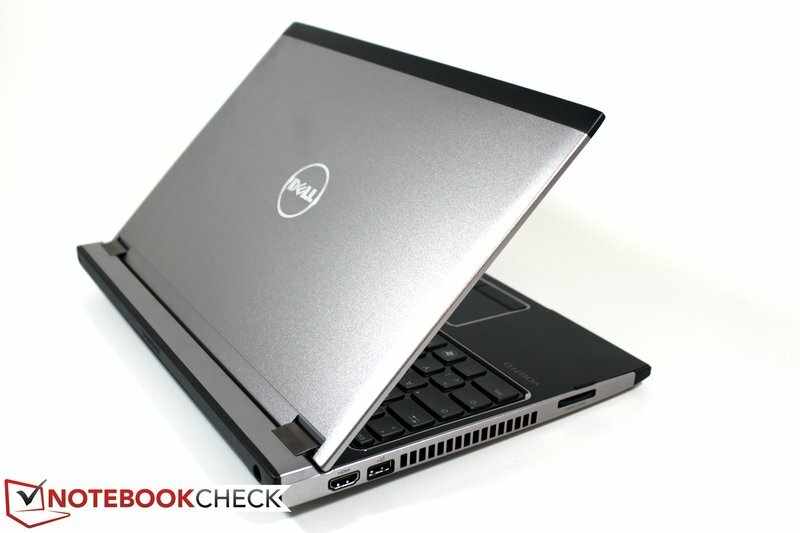 Dell now also turns to the chiclet design in the Vostro V131. Thus, the keys are inserted singly into the case. The gap looks very stylish due to its high-gloss finish, but also makes dirt and fingerprints very visible. In a direct comparison, we also notice significantly contrast poorer letters and chars. But you may counter with: "It's not a bug, it's a feature" right away because when the keyboard illumination is enabled, light penetrates through the chars and legibility is ensured perfectly in every situation, even in absolutely dark surroundings. The keyboard light also costs extra, though. Price: 30 euros net in the online configurator. As to the typing feel, something is different compared to the predecessor due to the base unit's new construction. The keyboard unit yields quite evidently, especially in the center. Users with a particularly strong stroke will notice that the keyboard coils a bit. But it doesn't have a negative impact during normal use. 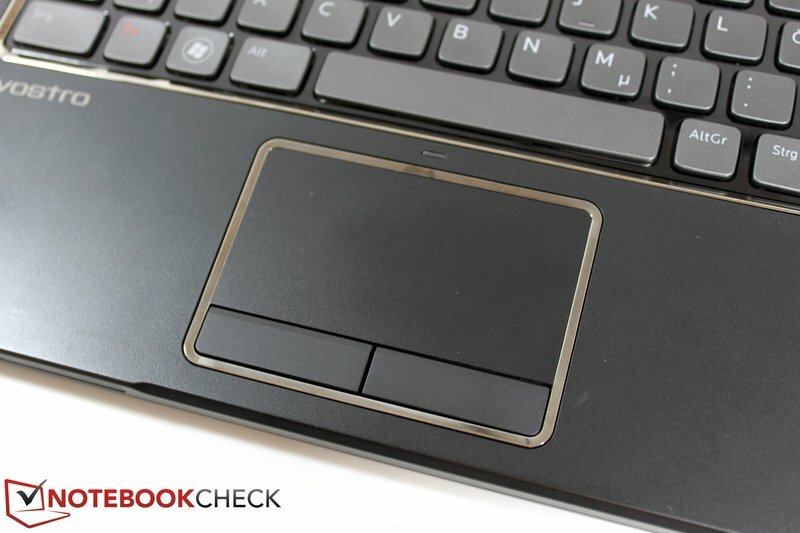 The clear pressure point paired with the medium key drop even allows longer, trouble-free typing tasks. There are three hot keys above the keyboard's right. 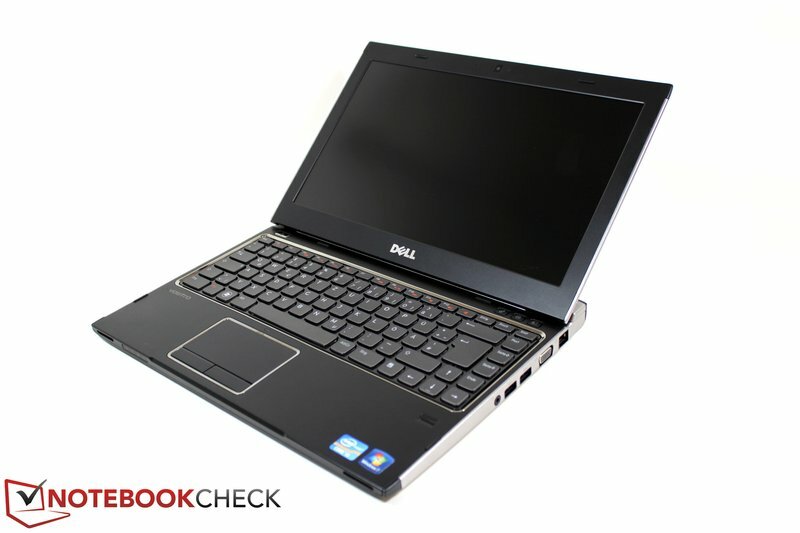 The right one can be mapped individually with assistance of Dell's Launch Manager. The middle of the three starts Dell's Support Center which, very similar to Lenovo's Thinkvantage tools, supplies an overview of matters concerning security, service and support, as well as recovery. The left key starts Window's Mobility Center (various system settings, display brightness, audio, network, etc.). The multi-touch pad can be modified to suit personal needs in the clearly arranged and illustrated driver menu. Scrolling in documents was only possible by activating the classic scroll fields on the pad's right and lower edge. Pushing two fingers is used for scrolling through documents on the built-in mouse replacement. So, not as may be believed for vertical scrolling through long text and Internet sites. As to gliding traits, the installed pad doesn't have to accept much reproach in terms of size and response. 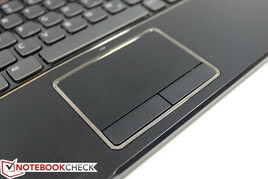 Both touchpad keys' clear stroke and their noiseless feedback made a good impression. Merely both keys' fairly deep fit in the case can get a bit annoying when used with the thumb. The specs of the installed screen have been maintained (13.3 inch, 1366x768 pixels, matt. However, the screen id of our test device deviates from that of the V130's built-in display (AUO312C). So, Dell installs new components here. In contrast to the Vostro V130, the Vostro V131 unfortunately looses about 15% of its brightness with a maximum of 185 cd/m2 in the screen's center. The new screen has an average of 170 cd/m2. The illumination of 82% is still on a good level. The V130 wasn't a paragon with a maximum contrast ratio of 144:1. This V131 isn't much better: 165:1 at a black value of 1.12 cd/m2. These key figures are likely also responsible for our only moderate subjective total impression in terms of color reproduction. This is only a minor issue for office tasks, but multimedia content suffers in any event. The reproducible color space deviates a bit from the predecessor screen, but basically plays in the same league. sRGB clearly remains unreached, which isn't inevitably a drawback, with exception for professional image editors and graphic designers. This sooner applies when you venture outdoors with the Vostro V131. You have to accept a more or less strong contrast and brightness loss depending on the viewing angle to the screen and position to the sun when sunlight provides bright ambient light conditions. The anti-glare surface can successfully prevent annoying reflections of the surroundings, but the screen's brightness is simply not enough to grant perfect outdoor use in every situation. Glare and bright or matt? The installed screen couldn't impress us in terms of viewing angle stability, either. The work fields turn out very narrow especially along the vertical viewing plane. Consequently, the tilt angle has to frequently be readjusted in mobile use. As usual, the screen does better on the horizontal plane. However, narrow viewing angles also cause increasing contrast loss here. One of the most important items in the Vostro V131's update catalog is likely the new hardware inside. Following the Arrandale ULV CPUs in the predecessor, Vostro V130, the latest Intel Sandy Bridge range is implemented in the new V131 - namely regular 35W TDP chips. The only ULV leftover is Intel's Celeron 847 CPU. It clearly lags behind the selectable alternatives with a basic clock of 1.1 GHz and without any turbo functions: i3-2310M (+130 euros) and i5-2410M (+180 euros). Faster main memories also move into the new Vostro V131 with Sandy Bridge. The Vostro has a maximum capacity of 8 GBs on two memory banks (2x4096MB), model DDR3 1333MHz. The basic configuration of only 2GB in the online configurator isn't quite up to date, though. You are well equipped with 4 GB (+90 euros) nowadays. 8 GBs only make sense for special applications (+190 euros). A brief glimpse on the current market prices for a 4GB 1333MHz memory module (again) raise doubts about Dell's surcharge policy. The corresponding components can be bought for starting at (gross) 20 euros and easily, even for inexperienced users, inserted via the maintenance cover on the device's bottom. Our test device was equipped with the strongest available CPU for the Vostro V131, the Intel Core i5-2410M The chip is categorized as a midrange processor in Intel's portfolio. However, it includes the most important and useful features of the latest Sandy Bridge range with Hyper Threading and Turbo Boost 2.0. The CPU's base clock is 2.3 GHz, but can automatically be clocked up to 2.9 GHz during load. The alternately available i3-2310M CPU represents the gateway into the Sandy Bridge dual core standard range. Besides the lower base clock of only 2.1 GHz, it particularly differs with its lack of the Turbo Boost feature. You are clearly better off with the i5 chip in high performance applications. However, Intel's Core i3 suffices for undemanding office use. 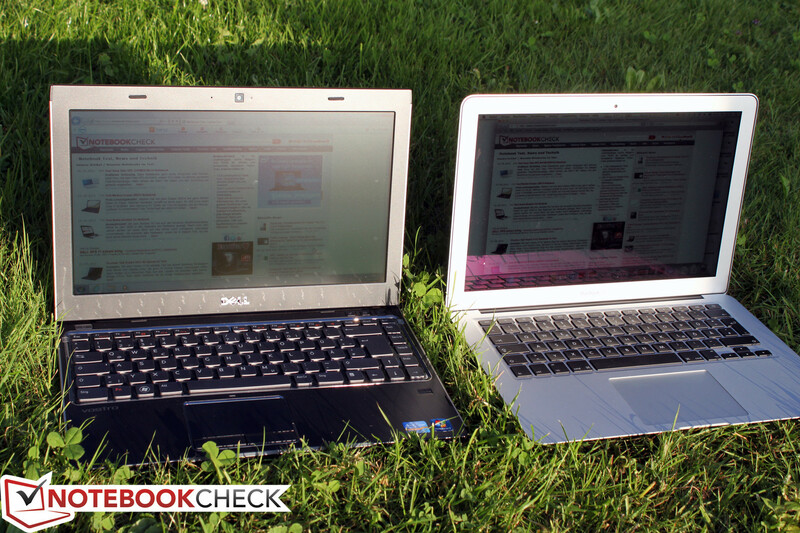 You can find a comprehensive comparison of the new Intel dual core processors here. 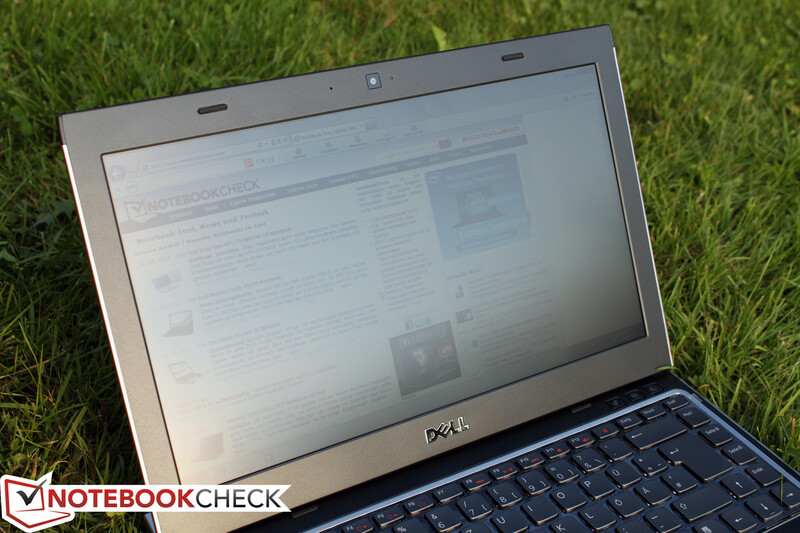 Unfortunately, we don't have any solid benchmark data about the Celeron 847 CPU. According the chip's model number, it is on about a par with the older Intel i3-330UM. This equals a performance loss of over 50% when compared to both Core i processors. The Cinebench benchmark test that we executed for the i5-2410M are all at the lower end of the range for laptops with an i5-2410M CPU. This could be a sign that the CPU turbo isn't exploited to its maximum. When we observe the CPU's clock rates during the Cinebench R10 single core rendering test, the frequency of both cores is usually 2.7 GHz. The CPU only repeatedly achieves its maximum clock of 2.9 GHz for fractions of a second. Both cores were constant at 2.7 GHz in the multi core test. Details about the processor and other benchmarks can be found on the single pages of our CPU comparison. Let's go on to the application benchmarks. They assess our Vostro V131 test system as a whole, including all installed components. 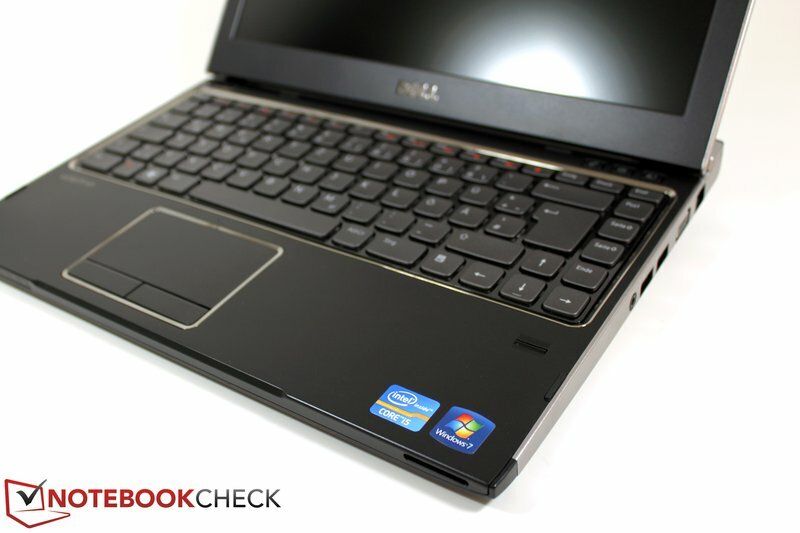 Our configuration accomplishes excellent 7736 points in PCMark Vantage and thus moves in the upper third of all notebooks we've tested. 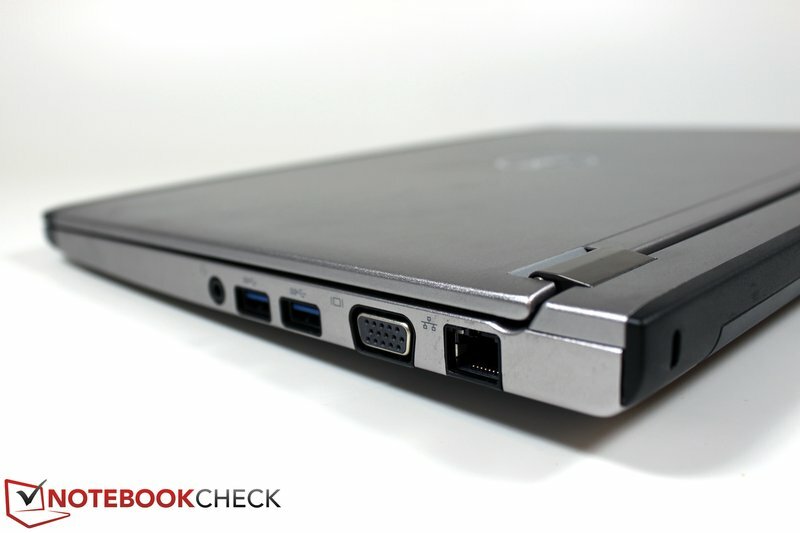 You find machines, such as the HP Elitebook 8460p with a strong i7-2610M CPU and AMD HD 6470M graphics (7734 points) or even Lenovo's Thinkpad T420 also with an i7-2620M processor (7845 points) in its immediate vicinity. 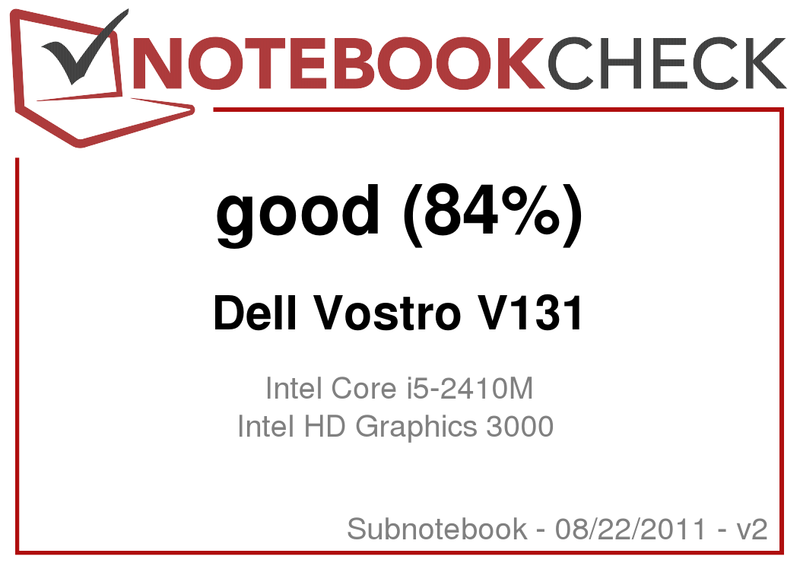 Dell's Vostro V130 with an Intel 470UM CPU only manages 3813 points in the same test. Thus, the V131 can more than double its performance reserves in its present configuration. The latest PCMark 7 rewards the Vostro V131 with good 2359 points and thus also places itself at the front. In comparison: Toshiba's Satellite R830 achieves 2936 points with the same CPU, but the installed solid state drive (SSD) supports it a lot in this case. 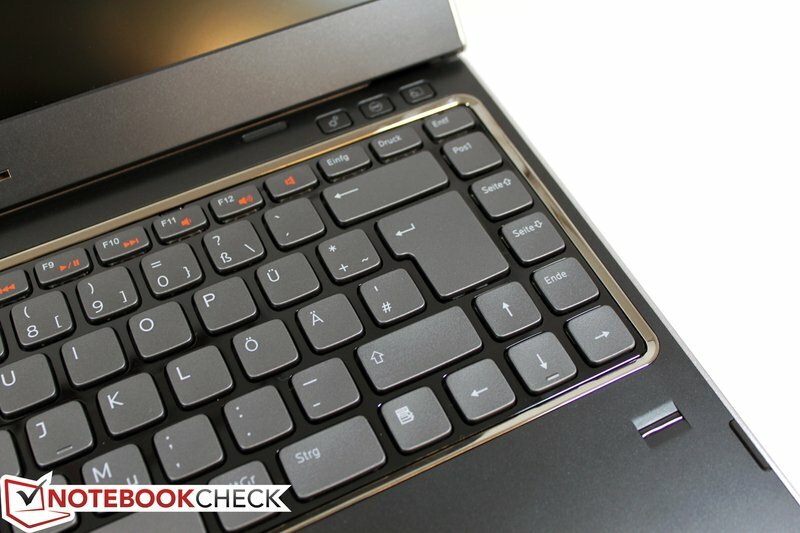 Lenovo's Thinkpad Edge E320 with an i3-2310M CPU clearly lags behind with 2009 points. 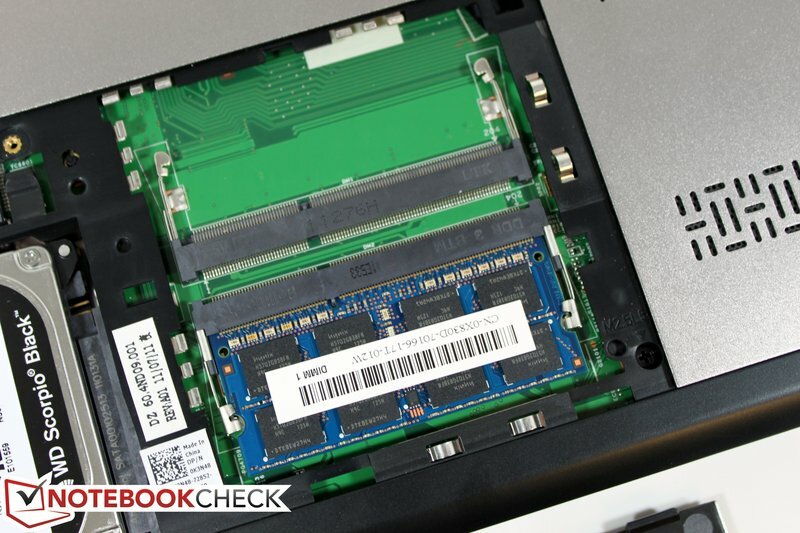 The Western Digital hard disk, WD5000BPKT, installed into our device gives us a preliminary taste of its performance with 4900 points in the PCMark Vantage sub score. It belongs to the current Vostro V131 model's standard portfolio with 7200 revolutions per minute. 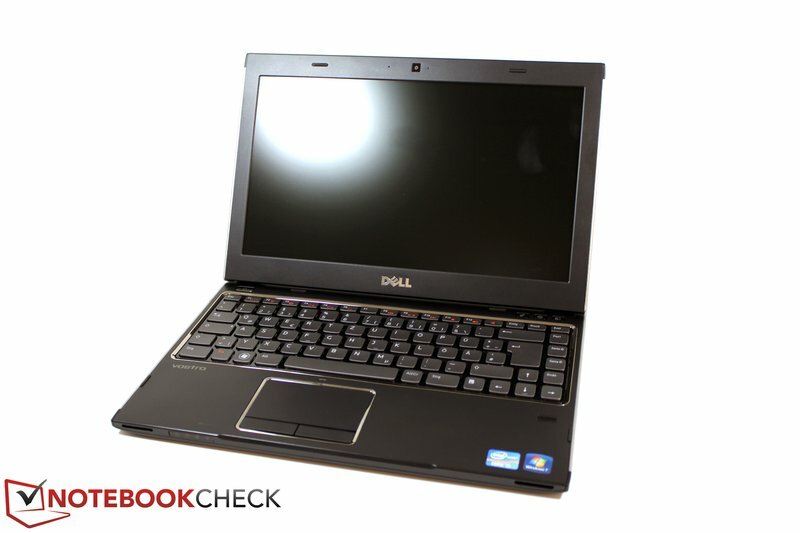 Dell no longer wants to use the otherwise still common 5400 rpm models. However, there are also fast SSDs to choose from. An unidentified 128 GB model can be selected for an additional charge of 220 euros instead of a 320GB/7200 rpm HDD. A larger 256 GB model is also supposed to be available. Back to our WD5000BPKT hard disk. The data carrier achieved good average transfer rates of 88.9 MB/s in the HDTune benchmark test. However, the access speed of fairly high 21.1 milliseconds remained obviously below the level of a 7200 rpm HDD. The Vostro V131 isn't really suitable for gaming with the Intel HD Graphics 3000 graphics solution. Nevertheless, single games can at least be rendered smoothly in low or medium graphic details. More information about which games run well on the HD 3000 Graphics can be found in our game comparison of notebook graphics cards. 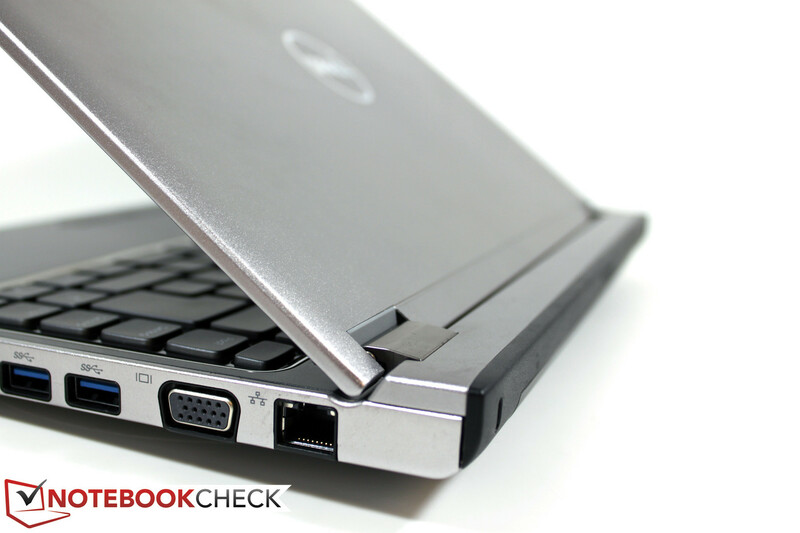 The Dell Vostro is always audible even in use without any load. Both the case fan, as well as the fast rotating hard disk, ensure a very audible, though not unpleasant noise. Beyond that, a short revving of the fan can be observed every now and again, which also is very present for a limited time. 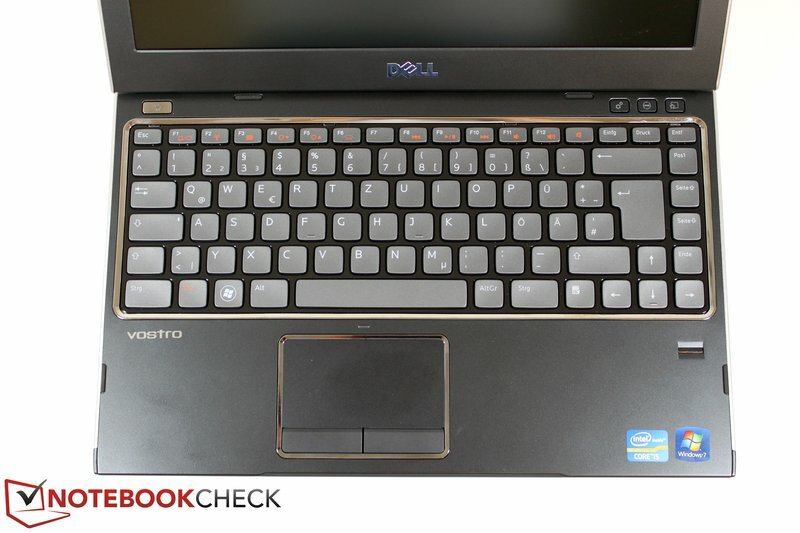 Finally, the Vostro V131 achieved maximum rates like a seasoned gaming laptop in the stress test: 46.1 dB (A). But this level is usually not achieved in practical use, not even in a load mix, for example in a computer game or in the gaming benchmarks: 37.8 dB (A). In operation without load or light office tasks, the cases temperatures are kept very much within limits. 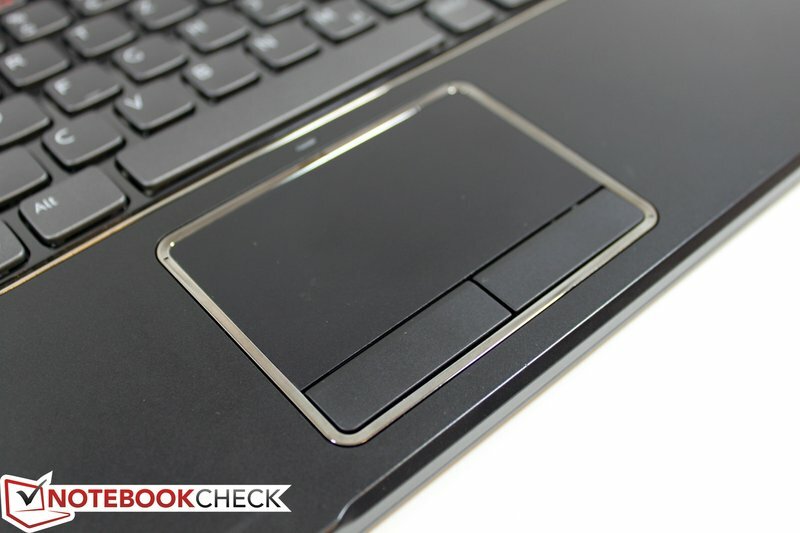 We measure a maximum of 31.2 °C in the wrist rest's left area. We measure the maximum of 32.5°C in the same area on the bottom. The heat development on the top is fairly reasonable during the stress test, likely due to the very active fan. Interesting: We again measure the maximum temperature of 38.7°C in the left wrist rest's area also during load. The same applies for the device's bottom with a maximum of 42.3°C. The hotspot is also identical in the left front area. The new Vostro V131 does a good job in the stress test's extreme conditions. The chip temperatures stay within an acceptable range even when both GPU and CPU are put under load. HWMonitor records a maximum rate of about up to 77°C even after over an hour of load. The CPU's clock rates stay constant at about 2.7 GHz. So, Turbo Boost still has an effect when all cores are put under load. Both speakers, located on the left and right front edge, do their duty in terms of rendering system sounds. An only thin, almost tinny sound not really worth listening to is emitted via both openings in the case when playing music tracks. Headphones or external audio playback equipment is warmly recommended for multimedia use. The power consumption is merely 6.7 watts in the energy savings profile without load (idle) and minimum display brightness settings. An exemplary rate. The Vostro V131 remains below the 10 watt mark when display brightness is increased to maximum (balanced profile): 9.1w. You have to reckon with a power consumption of about 43w in a load-mix. We record a maximum of 55.8w in the stress test. Thus, you are bestowed with sufficient reserves in the included 65w power adapter. 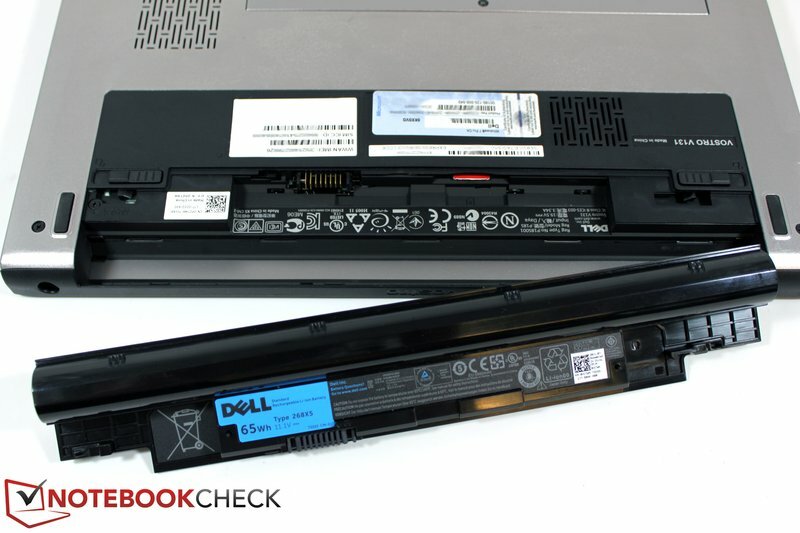 Dell likely wants to exclude customer dissatisfaction due to insufficient battery life with a 65Wh 6 cell battery (Europe) inserted ex-factory. Battery life was particularly a touchy issue in the predecessor, Vostro V130. The laptop was only equipped with a permanently installed 30Wh battery. Consequently, practical WLAN operation was only possible for about 2-3 hours. That is painfully little for a portable 13 incher. Back to the Vostro V131. Now a significantly better battery life result can be hoped for with the considerably larger battery and the attractive power consumption measurements made beforehand. And in fact: We surpass the 10 hour mark in BatteryEater's Reader's test, representative for the maximum possible battery runtime with minimum display brightness, disabled communication modules in energy saving mode. The practical WLAN performance (surf-mix with adapted display brightness, energy savings profile) is also impressive: Nearly 8 hours. The predecessor, Vostro V130, can be topped a multiple of times. A great presentation together with the just as evidently increased performance reserves, which is simply due to the more than twice as large battery for the most part. The Vostro will also be available with a 4 cell battery in the USA. Consequently, a runtime reduction of about 30% will have to be reckoned with in this case. 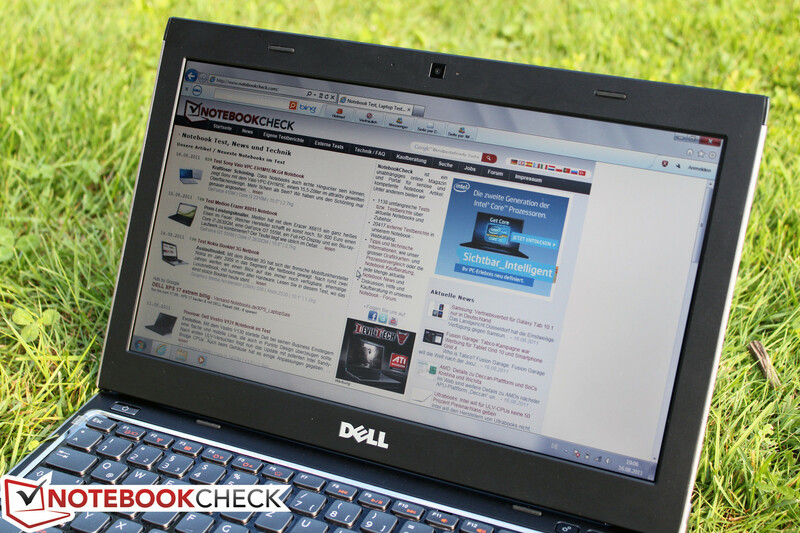 Dell has improved the Vostro V130 in many points with logical consequence. The new hardware inside has to be especially mentioned. 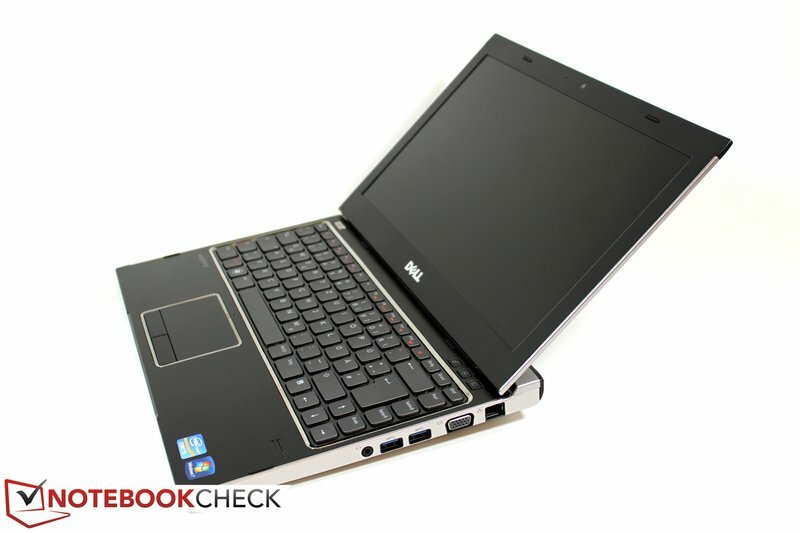 It now can serve with a much higher performance in comparison to the predecessor. So that Project Subnotebook isn't jeopardized, the Vostro V131 is also given a capacious 6 cell battery that can be replaced by the user from now on. It should also make the annoying search for a nearby outlet a thing of the past with a runtime of up to eight hours. The case has been slightly modified, in particular in the field of ports (2 USB 3.0s + powered USB 2.0). However, it makes an otherwise very similar, positive impression in terms of looks and stability. Merely the somewhat weak display hinge in our test device marred the image a bit. The keyboard was also given a makeover and is additionally provided with a light. 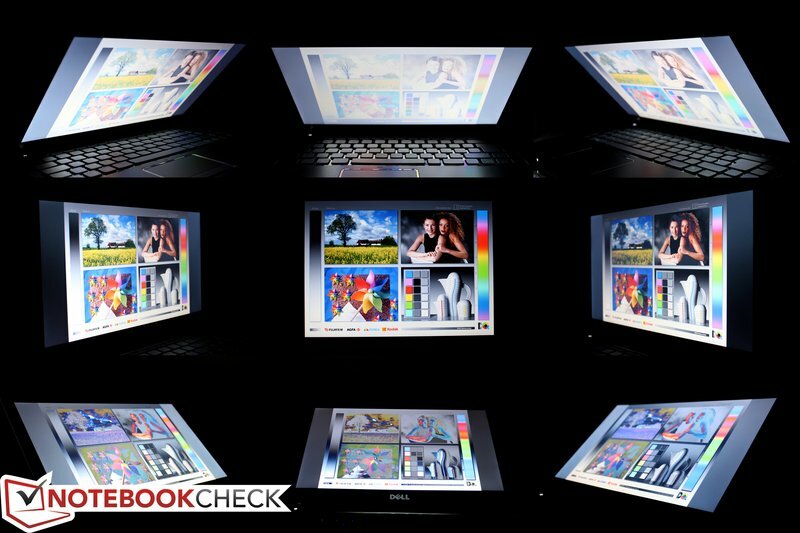 Ultimately, the display remains to be the weightiest con argument due to its only average brightness. Even if it's not a problem indoors, it is partly responsible for a more than difficult to read image particularly in bright ambient light conditions. 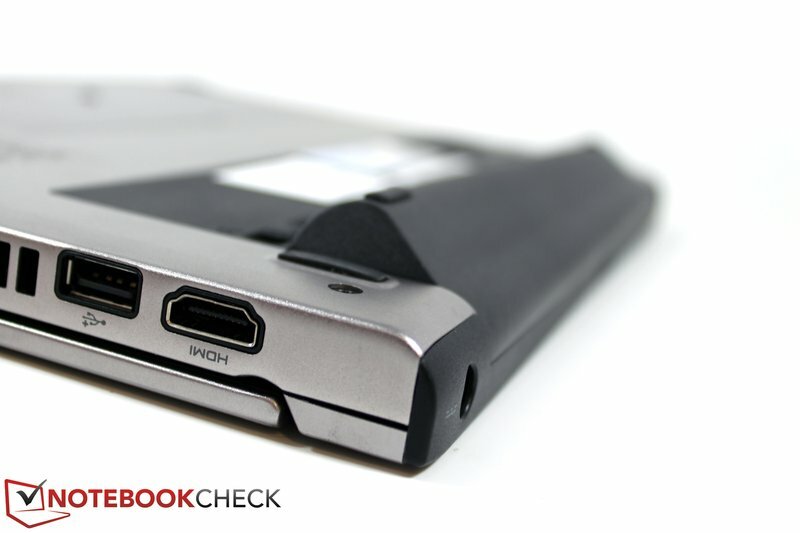 The laptop's permanently present background noise is especially ascribed to the 7200 rpm hard disk. Thus, in the end it's up to the user how much weight is placed on the single pro and con arguments. The Vostro V131 is available for starting at about 500 euros (incl. VAT) (Celeron). But it really starts to get interesting at 650 euros with the new Intel Sandy Bridge CPUs. More power, more battery life, about the same price. A really trouble-free outdoor suitable display with at least 250 cd/m2. 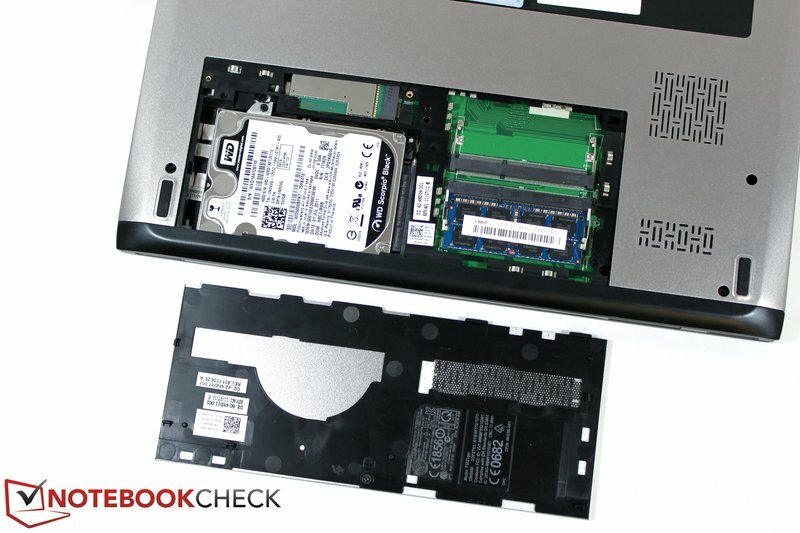 The optionally available SSD in our test device. The step backwards in terms of display is hard to understand. The opposite would have been logical. 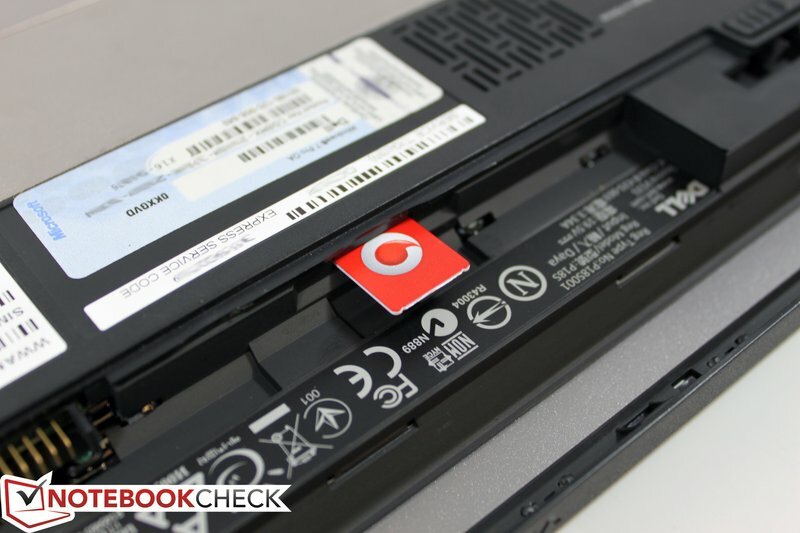 Will the possibility of a replaceable battery really be used so intensely, or is it only the wisdom: It's good to know that you can, if you like - even if you will probably never have to? Is this feeling really worth the clumsy, protruding battery?